My wife was lucky enough to have truly known her great granny. Great Granny had been born in 1857 which made her a venerable old lady as remembered by my wife. 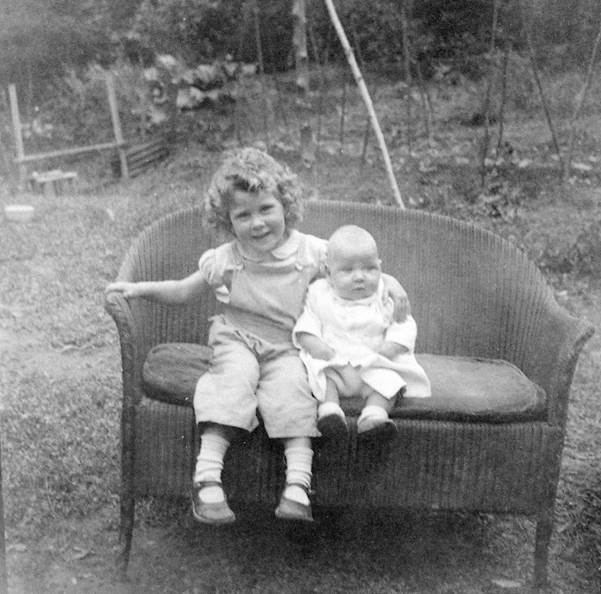 She may have been born in Gloucestershire, but she was a long term resident in Cornwall, mostly in Redruth where she raised her family and then living with a daughter in St Austell. Back in 1989 we took a look at the house on Poltair Road in St Austell. photo, pre digital of course, is stuck in an album and my wife wrote a note underneath it. Great Granny, apparently, said that had she known she was going to live so long she’d have changed out of the long black dresses. She was just short of 101 when she died. And here we see a group outside the same house in about 1952. Great Granny is at the back left with Great Aunty Dolly holding the little girl who is now my wife. The man in the photo was my wife’s father and we do not know who the other lady is. 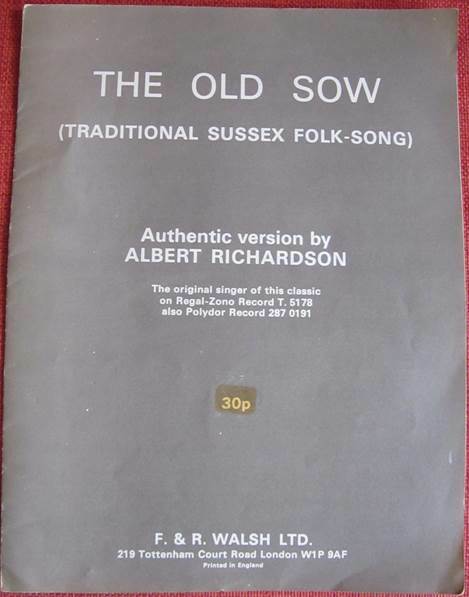 My dad, a true man of Sussex, was inclined, if ever the opportunity arose, to put on his best Sussex accent and sing, ‘The Old Sow’. You could say this song was his party piece. During my childhood I never heard it anywhere else. It was only as I started collecting 78 rpm records that I came across Albert Richardson singing it. To be honest, I thought my dad did it better. When my late sister was trading, she came across the record and also some fairly modern sheet music for this song. Altogether there are eight verses which get the piglets onto the breakfast table! It isn’t a song for vegetarians! The record is the one mentioned on the music front – a Zonophone variant. 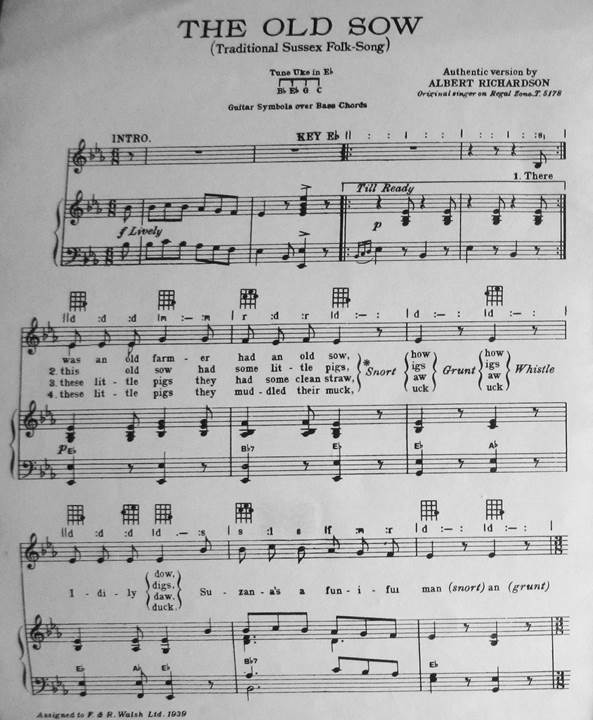 The sheet music has chords for a ukulele but Albert, like my dad, sang it unaccompanied. You can see and hear my old HMV gramophone playing this record by clicking here. My mum was a tea drinker – and I have followed suit. Mum was not a tea bag user. It was always the packet of loose tea for us. Mum’s preference was for Typhoo. I bullied her, in the late 50s to get Brooke Bond so I could collect the Out into Space tea cards. When money was tighter than usual a Co-op own brand was purchased. Mum always drank tea black although as a child, I had milk and sugar in mine. Oddly, for it has no connection with my mother, I have dropped both sugar and milk now so I have my tea just like mother did. Using leaf tea meant using a teapot. There was a ‘tea’ spoon, a perforated spoon with a perforated lid that could be opened and closed. You can still buy them, but clearly my mother never thought much of it. She used the pot. This pot! It’s made of aluminium, with plastic handle and knob and was used just about all the time. 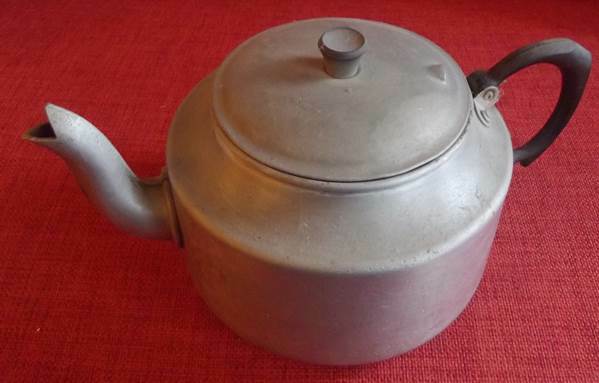 I inherited this for my dad was never a tea drinker and I used it for a while. But aluminium, rightly or wrongly, started to get a bad press. Some people think it links to forms of dementia. We stopped using the pot and have used china ones for years now. 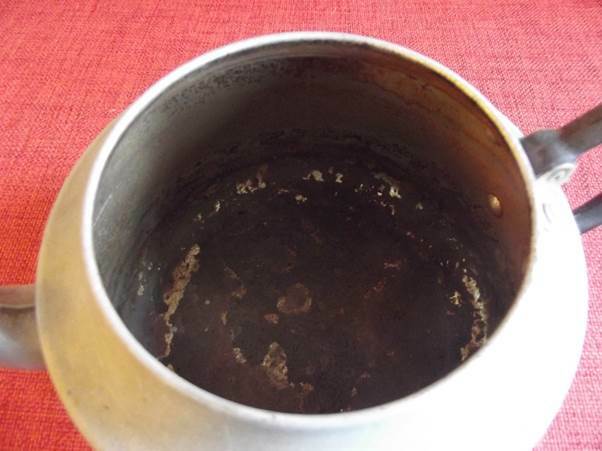 Not that any aluminium, inside the pot, ever touched the drink. The inside is deeply lined with tannin. I keep the tea pot purely in remembrance of my mother who died as long ago as 1967.